The decoration project of your bathroom should invite to calm and relaxation. Bathroom is a space for unwind while taking a hot bath at the end of a busy day or the place for starting your day, while trying to wake up. Bathroom could be your “spa” from home, a space for body care rituals. Minimalistic design is very popular in bathroom decoration and if you want an expressive space filled with charm all you need is to be brave and passion for interior design. 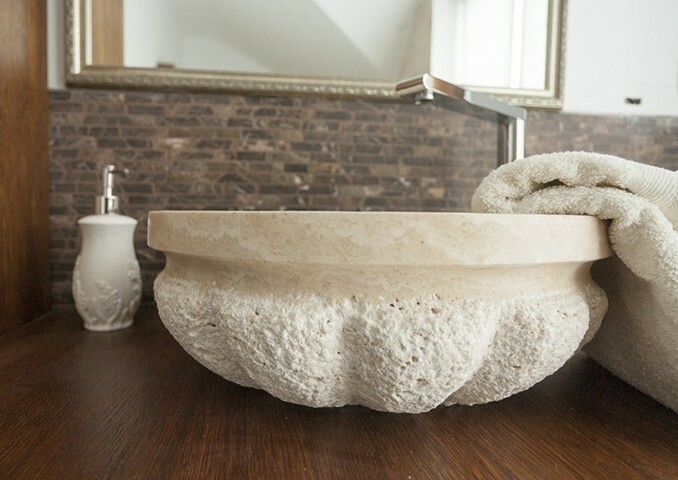 Materials are the most important and because of that we offer you five ideas for the bathroom sinks of your decoration project. The airy space is obtained with a combination of stone chiseled on the exterior and an interior with strong textures and shapes, like the ones from the above image. The image suggest a setting with basic natural elements (live plants and wood), a “back to the roots” with a modern twist. The displayed sink is a perfect match for a bright bathroom, due to a style that mixes dark color stone and grey shades veins. It becomes a showpiece of the space and includes chromatic contrasts with personality. Sinks with mosaic pattern can be the starting point for a very creative bathroom. This example is a huge inspiration for many project (as part of an old Romanian art concept or as reinterpretation of a Roman bath). The onyx sink makes the room look chilling and invigorating, unlike many products from the bathroom furniture section that warm up the space. 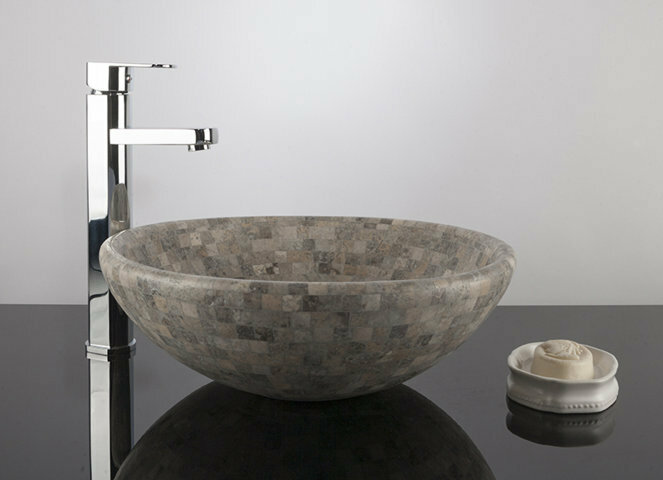 Due to its simple design lines, the onyx sink matches perfect with any decoration style. 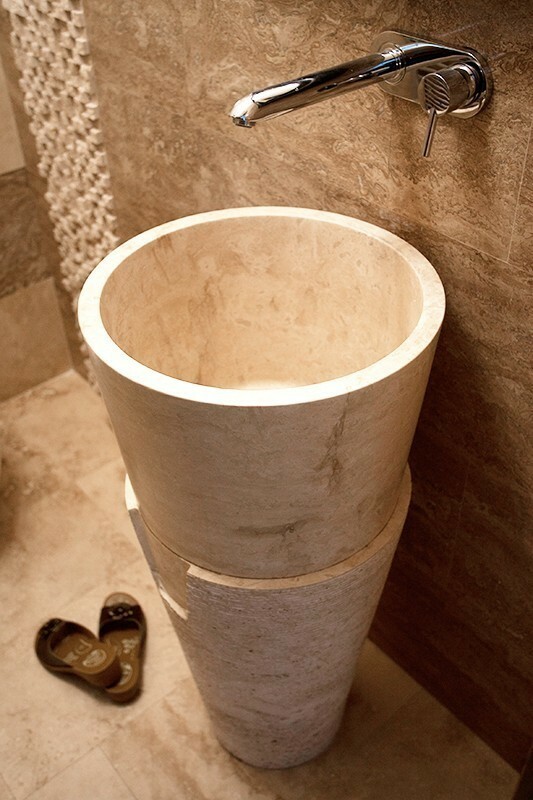 For project with sufficient space, use this sink as showpieces that will fill the vertical axis in a bathroom. Perfect finish associated with warm colors is the solution for a comfortable and relaxed setting. 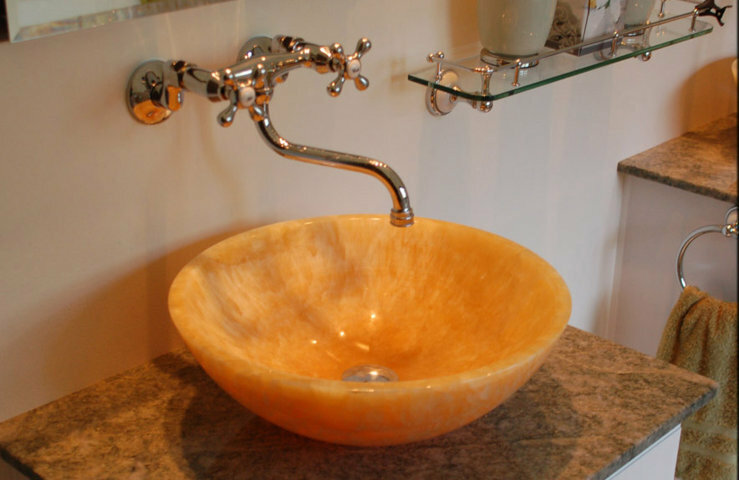 For further details on natural stone bathroom sinks, call + 40 318 222 333 or visit our showroom in Aleea Teisani nr. 137A, Sector 1, Bucuresti.